I recently upgraded my wire racks for cooling things like cookies to some that have crosspieces. They are so much better! 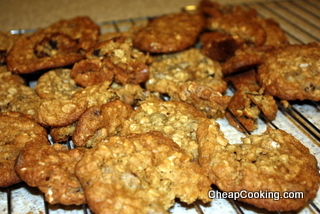 A good chewy oatmeal cookie with chocolate chips. Cream the butter. Mix in the sugars and beat well. Add the eggs and vanilla and beat until light and fluffy. Add the flour, salt and baking soda (sprinkling the salt and soda around so it’s not all in one spot) and mix. Stir in the oatmeal, then mix in the nuts and chocolate chips. Drop by spoonfuls onto greased cookie sheets and press down with a wet drinking glass (or your fingers) to flatten. Bake 10-12 minutes. Cool on a wire rack. Options: Add 1 cup peanut butter with the sugars. Use chopped peanuts if adding nuts. Or substitute raisins for the chocolate chips.